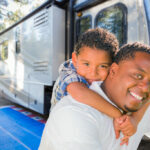 When is it Time to Get in the RV and Drive? The answer is: anytime you can! A good vacation, on which has plenty of time for you to really enjoy it, takes some time and planning. Most people save up, search for affordable options, make reservations well in advance and make sure they have time to get away from work. Sometimes, however, all the time it takes to do all that planning is simply too much. You need your vacation, or just a little time away sooner rather than later. That’s why it can be so important to jump up, get in the RV, and drive as soon as possible. Or, anytime you can. The world is busy, and sometimes crazy. It’s understandable, and some might argue advisable, to get away. It could be essential for your physical and mental health. There are many ways to get away, and if you have an RV, don’t let it go to waste. Turn it into a tool for your well-being; take it out and make your dreams of a great vacation a reality, anytime. Affordability: Sure, a lengthy trip can be expensive. Planning well is a sure-fire way to find the most affordable options. However, when you need that trip sooner, rather than later, there are other ways to help make it more affordable. For example, make it short. Take just the weekend to get away somewhere far enough that you’ll have plenty of time in a new place, but not so far that it’s hard to get back home and be ready for the next week. Go somewhere familiar, where you won’t have unexpected expenses. Go somewhere easy, and cheap. Save and plan for the big vacation, and take little, more affordable ones in between. Time: Do you have trouble getting more time away from work? Well, while you plan for more time for that big, lengthy break, take advantage of your normal downtime. Put off the weekend laundry once in a while and take a little trip instead. You don’t need a full week of vacation time to make a difference in your life. Relax for a day and half, and do that laundry when you get back. Find your downtime and make use of it. Ease: How simply can it be to get away? In fact, it doesn’t have to be complicated at all. If you take tips for making it time efficient and affordable, it will also be a bit easier automatically. You can simplify things by picking locations you know, but still make you feel like you’re getting time away. When you know places well, you know how much time things should take, how much they cost, etc. Then, it’s easier. Everyone needs a vacation, and that vacation might be long, or short. You might need more time away, or just a day. Either way, anytime can be perfect to get in the RV and drive as far as you can go to get what you need. If you need to have some time away, come to Bethy Creek.